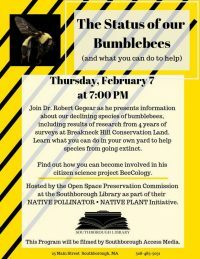 The Open Space Preservation Commission is sponsoring another talk about the status of important pollinators in Southborough. 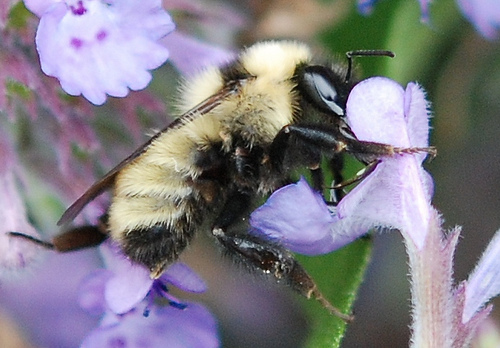 Next week, residents can learn what they can do in their own yards to help bumblebees. You can even volunteer to become a “citizen scientist”. For several years, many people have been concerned about the impact that the decline of pollinators has on our ecosystem. In 2015 year, I shared news that a steward of Breakneck Hill and volunteers were working with a WPI professor to study pollinators at the hill – bumblebees in particular. It’s a project that has been continuing for almost four years. Dr. Gegear has been researching the interrelationships between pollinators and the plants they feed on. In surveying bees on the hill, they discovered species previously thought to be wiped out from our state. The professor will give an update on findings from his study. He’ll also talk about how you can help. 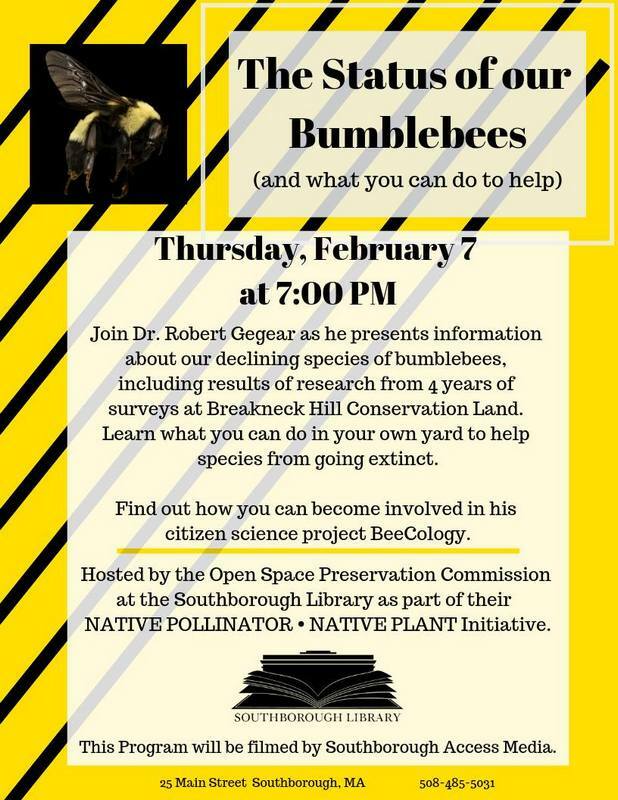 Join Dr. Robert Gegear as he presents information about our declining species of bumblebees, including results of research from 4 years of surveys at Breakneck Hill Conservation Land. Learn what you can do in your own yard to help species from going extinct. Find out how you can become involved in his citizen science project Beecology. Hosted by the Open Space Preservation Commission as part of our NATIVE POLLINATOR • NATIVE PLANT Initiative. As Director of the Gegear Laboratory at Worcester Polytechnic Institute’s Department of Biology and Biotechnology, Dr. Gegear Studies the behavior of plant/pollinator interactions and is the creator of the citizen science BeeCology Project. Working with the Open Space Preservation Commission he has trained Southborough volunteers over the past 4 years while he and his grad students have conducted season long wildlife surveys at Breakneck Hill, guiding important land management activities to help a rare species of Bumblebee there. *It’s not the first time, Dr. Gegear and the OSPC have teamed up to update the public on the important pollinator initiative. For more background on the issues facing pollinators, check out coverage of presentations from 2016 here and videos of spring 2018 presentations here.